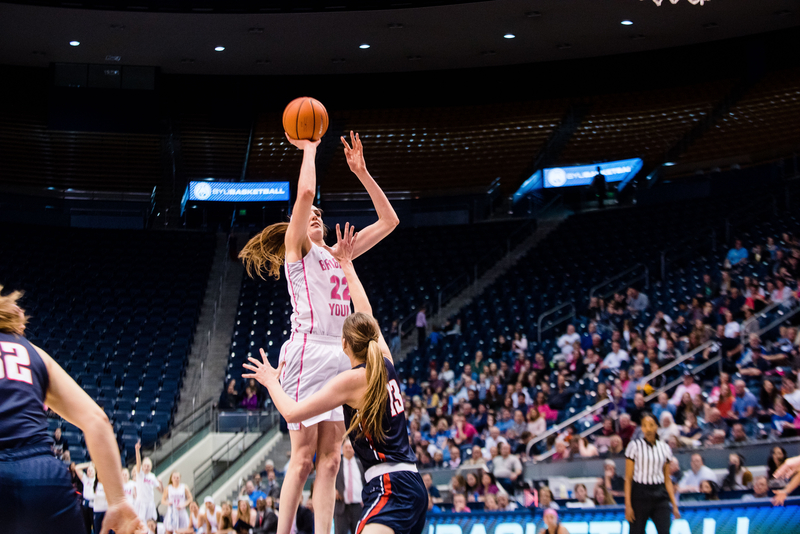 BYU women’s basketball lost 76-73 to San Fransisco on the road Saturday afternoon. Brenna Chase started the first quarter strong making the first two shots of the game for BYU. The Cougars went on a 5-0 run to end the first quarter with the lead, 15-12. Chase had 11 points and two steals for BYU by the middle of the second quarter. Sara Hamson also made some game-changing plays, with five rebounds and multiple steals. BYU led USF at the half 30-29. Malia Nawahine made an effortless three-point shot to give a BYU a boost to start the second half. Hamson had a major block to maintain the BYU lead, 46-42. She also had 10 rebounds by the third quarter. BYU took its largest lead of the game, 42-37, with two minutes left in the third quarter. The game was tied once again, 51-51, in the middle of the fourth quarter. Cassie Devashrayee caught fire in the fourth quarter, reaching totals of 18 points, eights rebounds and two steals. Devashrayee was fouled late in the fourth quarter and sank both free throws to bring the Cougars within two, 59-57. Paisley Johnson hit a pair of free throws with just 22 seconds remaining to give the Cougars a 61-59 lead. As time expired, the score remained level at 61 apiece, sending the game to overtime. Hamson made two free throws to give the Cougars the lead, 63-31, over USF early in extra time. The Cougars were forced to shoot a three to tie up the game again at the end of the period, and Devashrayee delivered, tying the game at 67, and sending it to double-overtime. BYU came up three points short in double-overtime, taking a tough loss to USF. The Cougars play Pepperdine at 6 p.m. on Thursday, Feb. 15 at the Marriott Center.